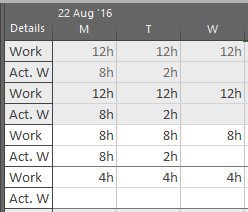 As you can see task is Fixed work type, and I put 3 days in the Duration. As you can see R1 should work 3 days and 8 hours per day which is 100%, and it equals 24 hours. On the other hand, R2 should work 3 days and 4 hours per day which is 50%, and it equals 12 hours. Actual Duration = Actual Work (R1) / Units (R1) = 10h / 100% = 1.25d which is not what shown on the screenshot above (0.83d). So Actual Duration is 0,6666 + 0,16666 = 0,83 Days! So that is Actual Duration for the Task. And it is always calculated with work and Actual work of all Resources, not one by one! This entry was posted in MICROSOFT PROJECT, Microsoft Project 2013, MS PROJECT 2010, MS PROJECT 2016, PMI, PRoject Management and tagged Micorosft Project 2016 - Schedule, Micorosft Project 2016 - Tasks. Bookmark the permalink.